Superior results on all precious and nonprecious metals. Silicon Carbide abrasive in a specially formulated polyurethane bond for long life – outlasts other types of rubber abrasives. 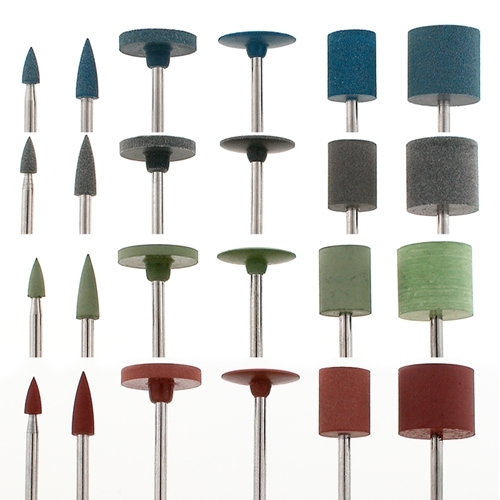 Eve® Poly Polishers are available in a variety of shapes and sizes to finish any jewelry item from the largest ring shanks to the tiniest settings uniformly and without a lot of dressing to make them fit. Mounted on 3/32" shanks. Unmounted wheels & cylinders have 1/16" holes and can be mounted on our Screw Mandrels. Max. operating speed: 15,000rpm. Available in 4 color-coded grits: Blue (Coarse), Gray (Medium), Brown (Fine Prepolish), and Green (Extra Fine/High-Shine). Sold in packages of 10 or in money-saving packages of 100. Also available in convenient sets (see "Related Products" below).